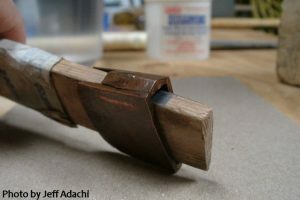 Blade Magazine has posted an article “How to Make a Sword” online, as part six of their “Knifemaking Series”. The article is authored by Don Fogg, an outstandingly talented bladesmith, and more importantly a true gentleman. It is a interesting and informative read for anyone fascinated with swords and their construction. As acknowledged in the article, swordsmithing is quite different from knifemaking. Although forging a knife is an excellent way to learn hammering, forge-welding, and heat-treatment, a sword poses some additional difficulties. Although the article does not focus specifically in the Japanese style, it is full of useful information for anyone looking to learn more about swordsmithing in general, and much does apply to Japanese style blades. Surely students of the dōjō will notice several differences between the methods, tools, and techniques and those described in the article. Obviously, at our own swordsmithing school we instruct students in our own method of forging Japanese style swords. But we are also quick to emphasize that students should do what works best for them. For those truly interested in learning swordsmithing firsthand, we would of course recommend taking a class at our swordsmithing school, Tomboyama Nihonto Tanren Dōjō, which, although not mentioned in the article, is the the only school of its kind in the world. We would suggest students begin with the Basic Forging Course. Last month, we were thrilled to have four alumni of Tomboyama Nihonto Tanren Dojo return to the school to attend our August 7-9, 2009 Oroshigane Seminar. Three alumni joined us two days earlier for special unscheduled two-day classes in bonji and kajioshi. Students Jeff and Allen carved bonji in blades they had forged themselves of folded cable and Steven studied blade shaping and practiced achieving subtle refinement of shape on the water stones. “Oroshigane” is a Japanese term used of the processes a smith uses to adjust the carbon content of sword steel, and also used to refer to the steel made from such processes. For the seminar, we began with two forms of iron, electrolytic sponge iron and antique wrought iron, which we added carbon, through the process of carburization, to create steel. Both electrolytic sponge iron and antique wrought iron are extremely pure forms of iron. In Japan, electrolytic sponge iron is known as denkaitestu, and is sometimes used for oroshigane by swordsmiths who cannot attain tamahagane, or are interested in making their own steel. Electrolytic sponge iron is literally “distilled iron”, a byproduct of the electric arc furnace. True wrought iron is an antique form of commercially pure iron. Although many products are described as wrought iron today, such as guard rails and gates, they are made of actually made of mild steel and only retain that description because they were formerly made of wrought iron. Because of it’s corrosion resistance, wrought iron was often used for marine applications in the past. Like denkaitetsu, wrought iron is an extremely pure form of iron, although it is also high in silica. It is distingiushable from mild steel by its fiberous grain. Because it is no longer made on the industrial scale, wrought iron is sometimes jokingly called “unobtainium”. Modern steel contains several alloyed metals and impurities, not found in nihonto. Some impart desirable qualities or counteract the effects of contaminents. Most important of these is manganese. Manganese prevents phosphorus (an embrittler) from migrating to grain boundaries and creating weaknesses, and also promotes deep hardenig. But manganese also makes steel shinier and more reflective, two qualities which make an sword forged from modern steel different from a traditionally made Japanese sword and which are instantly discernible to a experienced eye. By beginning with a very pure sources of iron and adding only carbon, we are able to produce a steel that is compositionally the same as tamahagane and visibly indistinguishable. Our Oroshigane Seminar lasted a three days: the first spent carburizing the two forms of iron, and the second two days spent building two different billets of steel. Three graphite crucibles were packed with alternating layers of crushed charcoal and iron. Once filled they were sealed with refractory cement. A layer of crumpled newspaper over the iron/charcoal prevented the cement from dripping down and introducing grit into what would hopefully become sword steel. The three crucibles were then loaded in a propane fire specially built for smelting steel for a five hour burn. The carburizing of iron to form steel is a product of both temperature and time. As long as the environment is carbon rich (carbon can be absorbed into iron as carbon-monoxide, but not as carbon-dioxide) , once the temperature has reached a high enough temperature, the carbon will precipitate into the iron. The burn being done outside in direct sunlight made judging the color inside the fire very difficult, but the crucibles did appear to reach a light yellow color. We estimate the fire reached a temperature of about 2100 degrees F.
The next day we eagerly opened the crucibles to examine our results. Did we create steel? The initial inspection indicated success! We eagerly light the forge and forged out a spatula-shaped paddle out of wrought iron. On this paddle, flakes of the now carburized electrolytic sponge iron were stacked and fluxed. Then using first a hand hammer, and then our Little Giant power hammer named “Lulu”, we began forge-welding the individual piece of carburized iron into a usable billet. Once the billet reached a large enough size, we cut a hinge in the middle, folded half over, and forge-welded the fold together. This forge-folding process serves to evenly distribute the carbon through the steel, just as kneading bread dough serves to spread the yeast throughout. It is this folding process that is also responsible for the grain or hada characteristic of Japanese swords. However, because heating of steel to welding temperature causes “carbon loss”, the smith must weigh the refinement of the steel and grain with the loss of carbon content during this process, in order to produce a quality billet sword steel. On the final day of the seminar, we proceeded to perform the same process as the day before, slowly building up another billet of oroshigane. Only this time the billet we built was comprised mostly of wrought iron, only a small percentage was denkaitetsu. This billet was also folded three times. Although we seem to have had great initial results from the August Oroshigane Seminar, until we forge, heat-treat, and beginning polishing a water stones a blade made from our oroshigane, we will only have partial confirmation. Michael and Gabriel Bell both plan to continue, each continuing to fold one of the billets and forging an blade, in order to gain further knowledge. An article regarding apprenticeships has been posted at our website, www.dragonflyforge.com.